Cornea ectatic diseases such as keratoconus carry devastating impact to our patients’ lives. 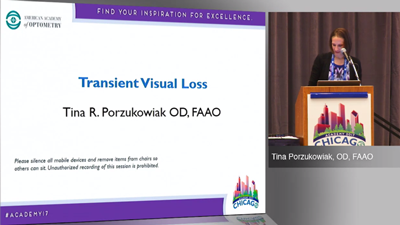 It is imperative for optometrists to deliver the most current treatment recommendations. This course will discuss new clinical developments and the latest patient management paradigm, such as emerging diagnostics, new variations to crosslinking techniques and adjunct surgeries to crosslinking. Dr. Clark Chang is Director of Cornea Specialty Lenses at Wills Eye Hospital - Cornea Service as well as Director of Clinical Services at TLC Vision. After finishing his residency program at Salus University, he further completed a fellowship in cornea and contact lenses. 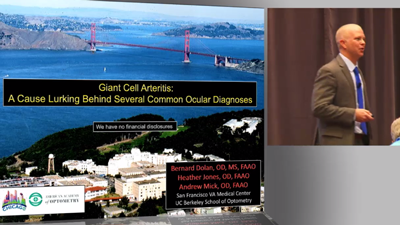 He has also been a subinvestigator in numerous clinical trials studying corneal cross-linking and has published extensively on keratoconus treatments with both surgical innovations and advancements in contact lens technologies. He is the immediate past president of New Jersey Academy of Optometry and the current vice chair of the membership committee at American Academy of Optometry. 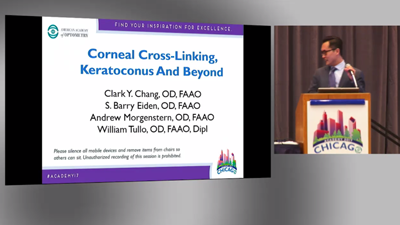 In addition, Dr. Chang is an advisory board member at International Keratoconus Academy (IKA), Gas Permeable Lens Institute (GPLI), and Optometric Cornea Cataract and Refractive Society (OCCRS). William “Bill” Tullo, OD, FAAO is Vice-President of Clinical Services for VGH-Vision Group Holdings, TLC & LVI Laser centers. Bill has maintained a private practice in his home town of Princeton New Jersey since 1988. Bill has a B.S. 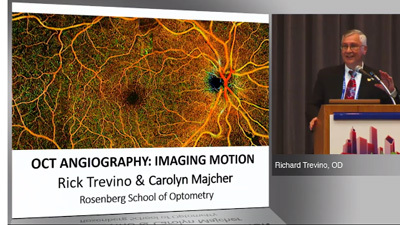 in biology from the SUNY Stonybrook and his Doctor of Optometry degree from the SUNY College of Optometry. Bill is a Fellow of the American Academy of Optometry, and a Diplomate in Refractive Surgery, Cornea & Contact lenses and a member of the American Optometric Association. 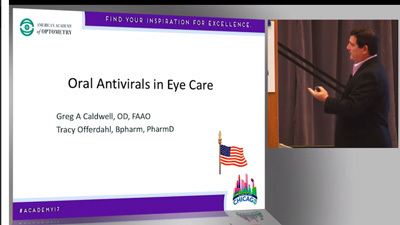 Bill has lectured internationally at more than 500 optometric and ophthalmologic meetings and he has published dozens of papers, posters, articles and book chapters. Dr. Eiden is president and medical director of North Suburban Vision Consultants, Ltd., a multi-specialty group practice with 2 locations in the Chicago area. 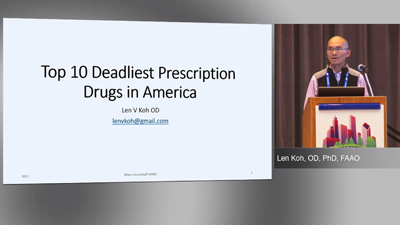 He is president and founder of the International Keratoconus Academy of Eye Care Professionals, an organization providing education and research to the eye care professions. Dr. Eiden is also co-founder and president of EyeVis Eye and Vision Research Institute, which is dedicated to clinical research and development of technologies in the eye care field. 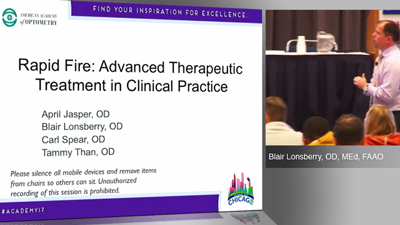 Dr. Eiden is an assistant clinical professor at the University of Illinois at Chicago Medical Center in the Department of Ophthalmology, Cornea and Contact Lens Service and an adjunct faculty member of the Indiana, Illinois, Salus, and UMSL Colleges of Optometry. He is on the editorial board of numerous professional journals and frequently publishes in the professional literature. Dr.Eiden is Past Chair of the American Optometric Association’s Contact Lens and Cornea Section. He is a fellow of the American Academy of Optometry. Dr. Eiden is a research consultant for numerous contact lens, technology and pharmaceutical companies and lectures extensively both nationally and internationally. Andrew S. Morgenstern, OD, FAAO, Diplomate American Board of Optometry is a Clinical Optometrist and founder of OcuSolve, LLC, a Healthcare and Management Consulting Firm. 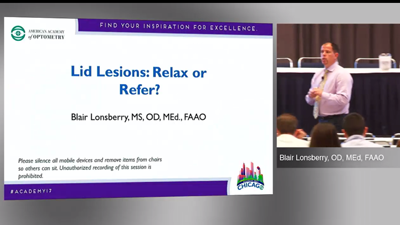 Lid Lesions: Relax or Refer?